We are a united community and family; we can achieve more when we stand together with a common voice. 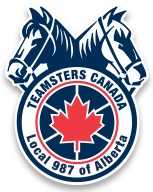 We are proud to be Teamsters, carrying on the powerful tradition of trade unions that have protected and empowered the working class for over 100 years. We are strong in our diversity, both among our individual members and the industries we represent. We are committed to enhancing and empowering the lives of our members. We embrace diversity and stand for equality in the workplace and in society as a whole. As part of a rich history of over 100 years of Teamsters in North America, we stand united with our brothers and sisters in the fight for your rights. We believe in standing strong together to promote fairness, respect and justice.